If Hollywood has run out of ideas to the point where it has to remake animated material in live-action form, it could hardly have picked a better piece than “Cinderella”. 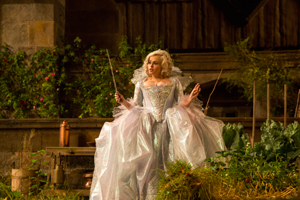 Lacking a supernatural or mythical super-scary monster, “Cinderella” instead features a gorgeous villain of epic sociopathic potential–one that seared “evil stepmother” onto the collective consciousness. Borrowing heavily from the 1950 animated feature, 2015’s “Cinderella” puts a new spin on the old story of an orphan girl living in servitude who finds her path to true love and a golden ticket out of a dead-end situation. Here, the young Ella grows up in an idyllic household anchored by her sweet mother (Hayley Atwell) and kind father (Ben Chaplin). As Ella grows into a beautiful woman (Lily James), her joyous life is interrupted by the sudden death of her mother, whose parting advice is for Ella to “have courage and be kind”. 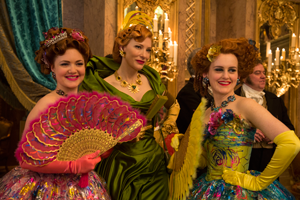 Her father eventually remarries–taking Lady Tremaine as his new wife (Cate Blanchett) and bringing along her beautiful-on-the-outside-but-ugly-on-the-inside daughters, Drisella (Sophie McShera) and Anastasia (Holliday Grainger). At first, the relationship between Ella and her step-family seems relatively innocuous; the glamorous Tremaine is generally warm in demeanor, and Ella’s materialistic step-sisters are nothing more than pretty bobbleheads. But times must change, and Ella’s father succumbs to an illness while traveling on business. Ella grieves heavily for the loss of her father, while Tremaine fears the loss of standing and income. Concerned about the servants’ wages, Tremaine releases the staff and gently encourages Ella to assume the various roles they occupied. Ella takes most of these tasks in stride, even after suffering the humiliation of being unceremoniously relocated to the drafty abandoned tower attic and renamed “Cinder-Ella” for the ash-coated face she sports after a warming night on the kitchen floor in front of the fireplace. The catty Drisella and Anastasia cackle over their breakfast with their now-openly repellent mother, and–in her frustration–Ella dashes off on a horseback ride into the woods to clear her head. She stumbles onto a stag hunt, where she meets a handsome man who calls himself “Kit” (Richard Madden). The two share playful banter: she insists he spare the life of the stag, and he dodges her questions about his place in the palace where he claims to live as “an apprentice”. After they part, “Kit” (the prince) returns to his father’s side (Derek Jacobi) and they plan for a grand ball at which the prince may select the bride of his choosing. 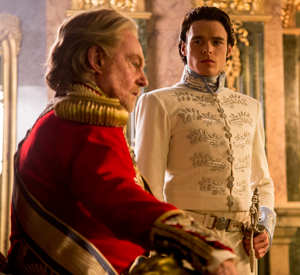 The king and his grand duke (Stellan Skarsgård) plan for an all-princess affair, to seal the kingdom’s future, but the lovestruck prince agrees only on the condition that all maidens of the kingdom may attend. This movie has many things going for it, such as a fantastic cast and truly breathtaking costumes (surely worth at least an Oscar nomination, if not a win). Blanchett’s Tremaine is nearly continuously draped in green satin that fits so wonderfully it’s hard to tell if she’s wearing the satin or if it’s wearing her, and Ella’s pivotal scene dresses (both at the ball and at the end of the film) are utterly breathtaking pieces likely to inspire many a formal gown. Blanchett gleefully and evilly chews scenery, in a rare opportunity to play the baddie, while Nonso Anozie seems to equally enjoy his turn as the pure-hearted Captain. Chris Weitz’s screenplay gives Tremaine context and depth not seen in previous versions of the story while showing mercifully precious little action from the mice and cat, making this version of “Cinderella” a bit more adult-friendly. Where things are less perfect are in things like James’ affected performance at the ball, with flourishes that likely were meant to suggest Cinderella was transformed and carried away by the magic of it all–but coming off more like an animated movie character in a live-action film who thinks she’s still in an animated movie. Madden does a decent enough job, but some of his lines are a bit too pouty or silly; he seems better suited for the grittier and less fanciful material (or perhaps he was just so good in “Game of Thrones” that it’s hard to see him a role with a comedic aspect). And as much as I love Bonham Carter, I’d like to have strong words with whoever fitted her for the oversized, overpolished teeth the Fairy Godmother sports; she talks around them no better than a vampire in a B-grade movie. This film runs 40 minutes longer than its predecessor–due partially to Ella’s backstory–and it could have been sped up at times. Still, the run time is short enough that most kids shouldn’t be squirming in their seats. All in all, “Cinderella” is a movie that appeals well to all ages; its non-scary nature makes it a great fit for the younger set, and its strong cast is a good draw for those of us well into the double-digits of age. It’s easy enough to overlook its shortcomings, since they don’t detract enough to keep this from being anything other than what it’s meant to be: a (updated) reboot and instant classic. “Cinderella” is preceded by “Frozen Fever”–an animated short that returns us to Arendelle just in time for Queen Elsa to give Princess Anna the best birthday ever. Unfortunately for Elsa, the “fever” referenced in the title isn’t a metaphor, and her plans are partially derailed by the wee snowmen that manifest each time she sneezes. The short is cute, and it is a precursor to the just-announced “Frozen 2” that’s entering development, although I don’t see this as the Oscar-winning material of prior shorts, like “Feast” (which preceded “Big Hero 6”). Fans of “Frozen” will surely enjoy it, thought, and truly that’s what it’s all about. 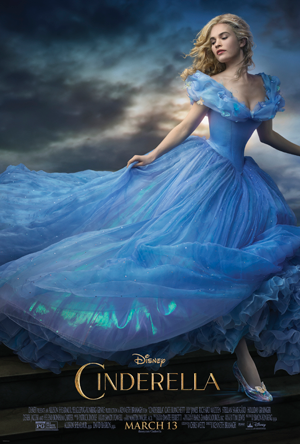 “Cinderella” opens nationwide on March 13, 2015. This movie is rated PG for mild thematic elements.